The blanket of snow which lay, across the picturesque deer park, surrounding the 17th century Quendon hall mansion, created a perfect romantic atmosphere for the beautiful wedding of Sukh and Hardeep. This truly was a ‘white wedding’ and although looking outside, things appeared serene, inside the reception marquee, it was nothing short a crazy wedding party about to get underway! We joined the happy couple as they made the ‘Grand Entrance’ into their reception; never before have we seen so much cheering and dancing in the aisle before we have stepped onto the dancefloor. It was clear the couple were truly enjoying themselves; all the guests that came forward to give them a warm, joyful and excited welcome! The newly weds and guests were then seated for starters served by ‘Indus’ catering whose food always leaves you wanting that little bit more. The couple then opened the celebrations with their first dance to ‘Aerosmith – I Don’t Wanna Miss A Thing’, after which the truly talented DJ Jags Klimax, spun a fine blend of tunes, keeping the dancefloor kicking! We later did our ‘Start The Night’ performance where Sukh and Hardeep were having a great time with all their friends and family, this was magical! 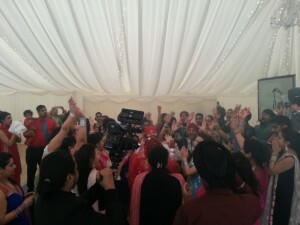 The event was cuptured by some of the wedding industries finest: ‘Shaadi’ videography and ‘Topaz Media’. 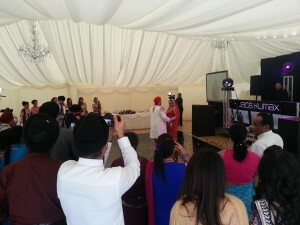 Sukh is a colleague and a friend so to perform on his special day was an honour for us. Congratulations Mr and Mrs Bansi!